Thread: In praise of... CLEANER WAX! Re: In praise of... CLEANER WAX! I still like to use Cleaner Wax for oddball things like grills n stuff. I've had this bottle so long that I don't even remember when I bought it. It's at least 10yrs. old... But I wouldn't doubt if it's from the time of my 1st car, which would make it 18yrs now._. Sure you can. But the cleaner wax will end up removing it. Only the excess polish sitting on the surface. That's not been my experience yet, but I have not tried it on newer paint. What's the make and model of your new car? Wow, never heard of this happening. Care to ellaborate? How did you use the product? How old is the product? What was the condition of the paint before? Have you tried polishing the yellow stains out? We have been discussing this in another thread. It's located in our Customer Service Hotline section for reference. I have a white car, and Cleaner Wax works great on it. Yes sir, like I said before. I was too put very full trust in Megs big name. but when its happen, where is the faulty then? I'm a really open, so if megs want to blame car manufacturer or even me, then lets talk. I'm not doing any black campaign here, I have all the documentation and after all this item is a customer line product not a professional product. Please everybody can read the comment on the link I give, and each of you feel free to comment. 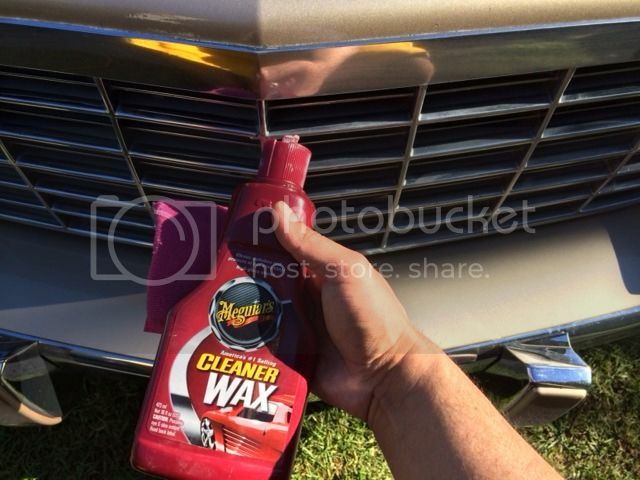 MIke, DC liquid cleaner wax VS IMPROVED DC liquid cleaner wax; what's the diff?